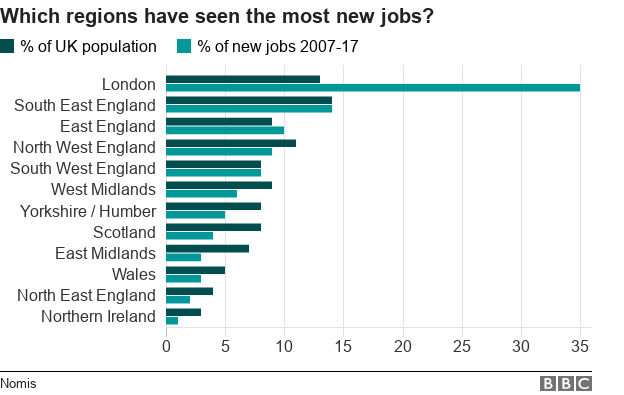 One in three new jobs created in the UK over the past decade has been in London, analysis shows. Employment has been rising across the country but by far the strongest growth has been in the capital, according to official employment statistics. Labour said its proposals would rebalance the economy away from south-east England. The UK Government said it was committed to boosting local growth outside of London. London has long attracted young people looking to break into the city’s established creative industries. Nyheke Lambert, 28, is a seamstress and pattern cutter, originally from Birmingham. She moved to London to start her business in order to be closer to potential clients. “I needed to be among the greatest of the greatest. “There just isn’t the demand in Birmingham. Even when I was living there and freelancing, all of my clientele was in London – so I was still visiting every week for fittings. Total employment in the UK has risen steadily over the last decade, with an average of 32 million people in work in 2017 – the most recent year for which full statistics are available. London was already the UK’s most economically productive region before the 2008 financial crisis. It has since strengthened that position. “What is more important than ever is access to knowledge, skills, ideas and high-skilled workers and London has that in abundance,” said Naomi Clayton, policy and research manager at the Centre for Cities think tank. Tony Wilson, director of the Institute of Employment Studies, described London as a “jobs machine”. “The areas of the economy in which London has been historically strong are areas which have seen very strong growth in the last decade,” he said. Employment in Wales grew by 6% over the period, while its population grew by 4% – the second lowest total of any UK nation or region behind the North East. 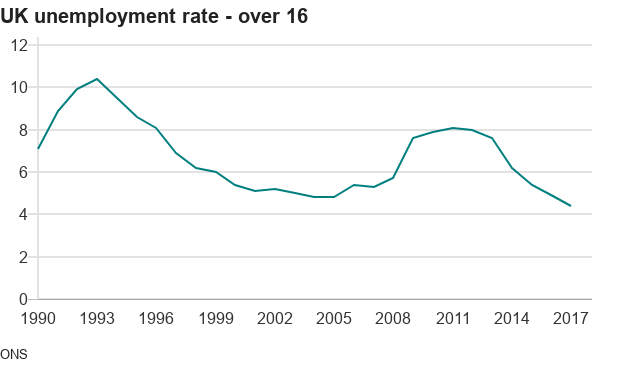 The number of people in employment in Scotland has risen four per cent in the past decade, while its population increased by 4.7%. Employment in the north-east of England grew by 2.5% over the last decade, the slowest rate of any UK region or nation. The number of workers in the region employed in care or leisure work, customer service or sales roles, rose to one in five by 2017, the highest rate in the country. Sara West, 52, runs a business that hosts murder mystery weekends. She formerly worked in the communications department of Stockton-on-Tees Borough Council. “Leaving my job was terrifying,” she said. “I was leaping out of a secure permanent position to set up my own business. “I wasn’t necessarily confident about creating my own work, but it had reached the point that if I didn’t try then I wouldn’t know. “If I couldn’t do what I’m doing know, I think I would probably find myself in a minimum wage job. Total unemployment fell in August to 1.36 million – a rate of 4% and the lowest figure for more than 40 years. The UK Government has said the high employment rate was proof its economic policies were working. Following the 2018 Budget, Liz Truss, the Chief Secretary to the Treasury, spoke of a “real jobs miracle in this country”. But Professor Christopher Warhurst, director of the Warwick Institute for Employment Research, said companies were providing too many low-skilled, low-wage jobs. “One thing the UK Government could do is what we call ‘paving the high road’ by creating not just more jobs, but better jobs,” he said. “UK Governments of all stripes have said in times of crisis that what we need are any jobs – but such employment has never been sustainable. Both Labour and the Conservatives have revealed policies which they claim will boost growth in regions outside of London. John McDonnell MP, Labour’s shadow chancellor of the exchequer, said: “The Tories’ mismanagement of our economy has been underpinned by workplace insecurity and low pay.